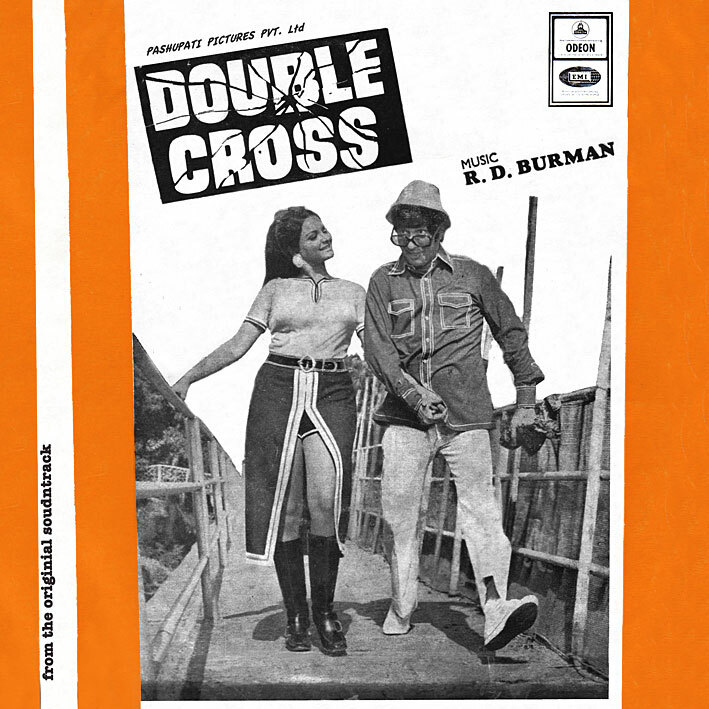 Rounding off this week's EP section, here's a pair of nice RD Burman efforts. 'Double Cross' [review] has him in an upbeat poppy mood with four songs that, while hardly his finest are all sprightly and fun enough to get your feet tapping and your soul smiling. 'Main Jhonka Mast Hawa Ka' is my favourite I think (for the weird bits), with honourable mention going to 'Aiyo Aiyo Kahdo Zamane Se', another one that borrows from the Cuban classic 'El Manisero'. 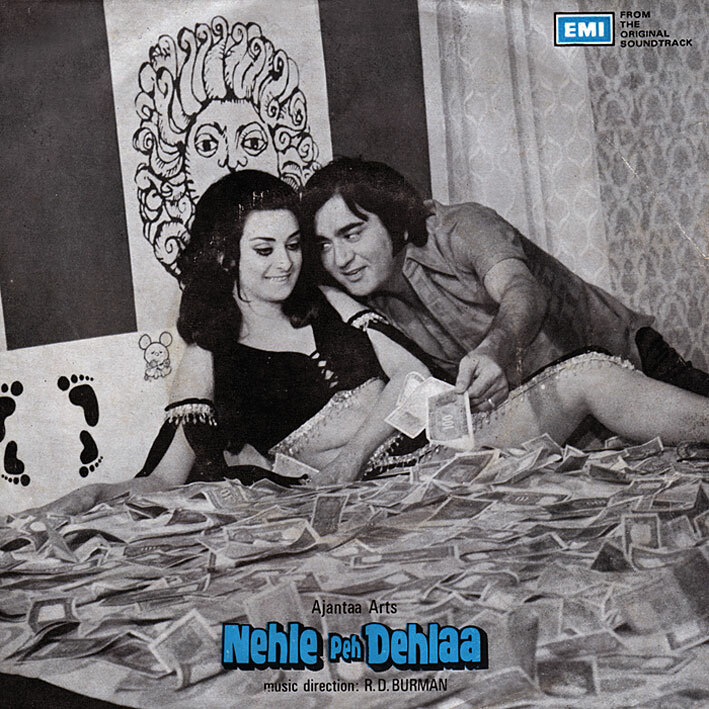 'Nehle Peh Dehlaa' is more mellow in tone, the first half anyway. Asha's sweet 'Main Choron Ki Rani' is probably the best song. At least the most immediate. I'm not entirely sure about the two tracks with Kishore on them, but last I played 'Mashooq Apne Shabab Men' I found myself humming it for hours after, so that has to have something going for it. Most of the songs are truncated though, damnit. cuz they shorten the songs to fit them on there! I prefer CDs to EPs in that case. LPs are best! Sa Re Ga Ma company is crazy to not include the dialogs, title music, dance music etc on the CDs. Lucky are we who know about the existence of those wonder melodies that exist ONLY ON LPs. The 7" format is pretty much my favourite ever, so I do have a soft spot for the EPs… what they should have done is pressed them at 33rpm to make room for full length songs. Never been a fan of CDs much, so I'm kind of glad that digital downloading is about to render them obsolete. I would suspect the exclusion of dialogue and instrumentals is SaReGaMa or whoever catering to what the majority of the public wants. Thus not a lot of incidental background music either. IMHO, LPs rule for containing the original content in warm, rich vinyl sound with wonderful cover art and occasional inserts that CDs cannot match. Been following your blog for over a year now but been too shy to comment.... but I thought, what the heck. Great site and just love the music. Reminds me of my childhood back in Malaysia. Seems like we share the same taste in music; hindi anyway. Totally agreed! Music gets taken care of once we buy a good condition LP. About the movies, yes, the fools do edit a lot of good stuff to "fit" em on there. I don't understand why do they have to do that to DVDs!?? There is enough space on the DVD to fit 180 minutes of video easily. Hate it! All we can do now is start collecting the original reels from the movie theater people and convert them to personal DVDs. How does that sound? haha...give it a thought. There are tons of theaters back in India that have all the old reels still in great condition. 180 minutes... that's, what? About half an average Bollywood movie, yeah? Love those movies and LOOOOVE those Soundtracks.